The eighth and last round of the Northern Region Explore Series 2018 was held at Tyne ARC on Sunday 7 October. 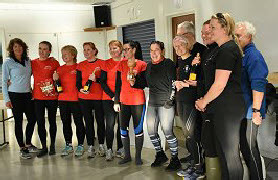 It was a Sculling Splash and Dash competition and ran in at times quite wild water. Fortunately the conditions downstream were better, so the course was reversed and moved to run through the bridge back upstream from NUBC after an hour and we finished OK.
Coming in to this round Barcing Mad (Berwick ARC) led the open league by 5 points from Tynemouth Buoys (Tynemouth RC) and only had to turn up at Tyne and race to win. 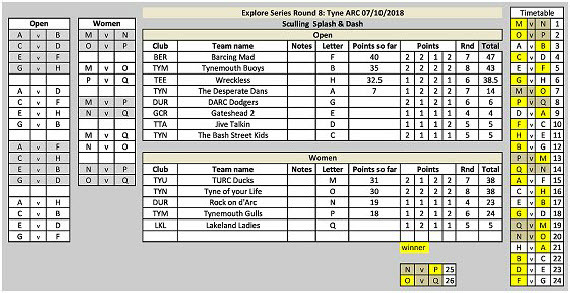 In the women’s competition, Tyne of your Life (Tyne ARC) opened one point behind TURC Ducks (Tyne United RC), so either could have won. This meant the overall winners in the open league were Barcing Mad, with Tynemouth Buoys second. 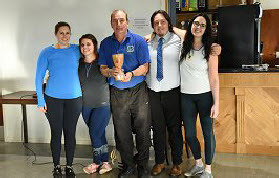 There was a tie between TURC Ducks and Tyne of your Life in the women's league and the two women’s teams will share the trophy across the river. Thanks to all at Tyne ARC for providing hospitality. Results and scores from the final round are here as a pdf or click on the image below for a larger jpg. The final league tables (with round winners indicated in yellow) are here as a pdf.